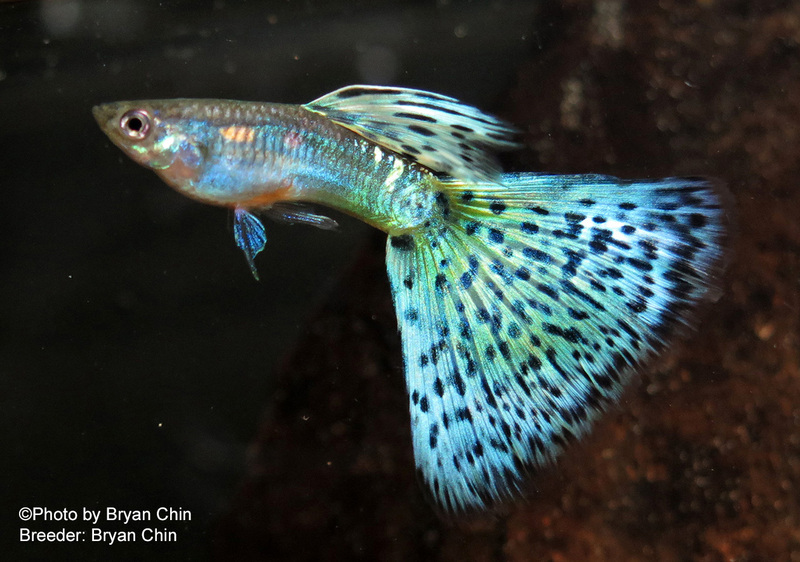 The blue green bicolor guppy comes in many types. 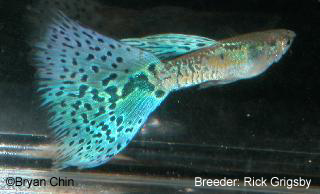 blue, green, or blue-green must be the dominate color over the secondary color in the tail. The dorsal should match the same color and pattern in the tail. 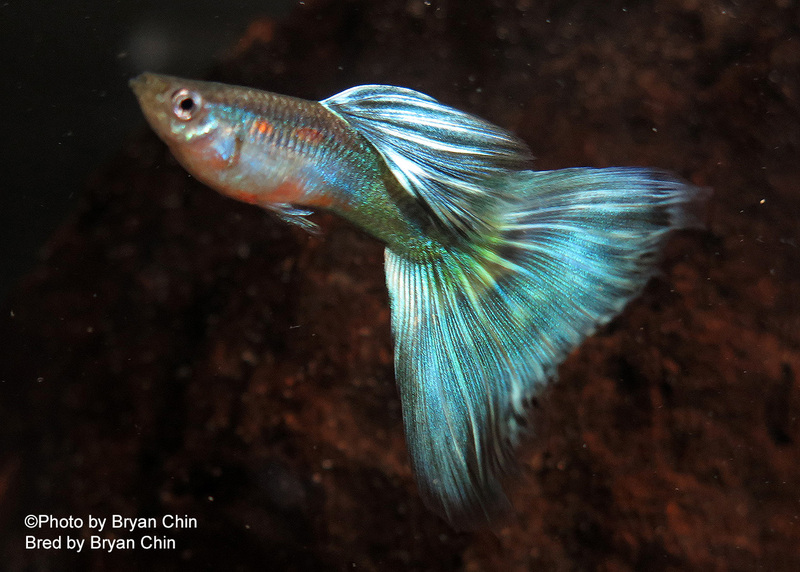 A blue green bicolor must have a base color that must be blue/green/blue-green and the secondary color must be at least 25% of the tail color. Both colors must be distinct. 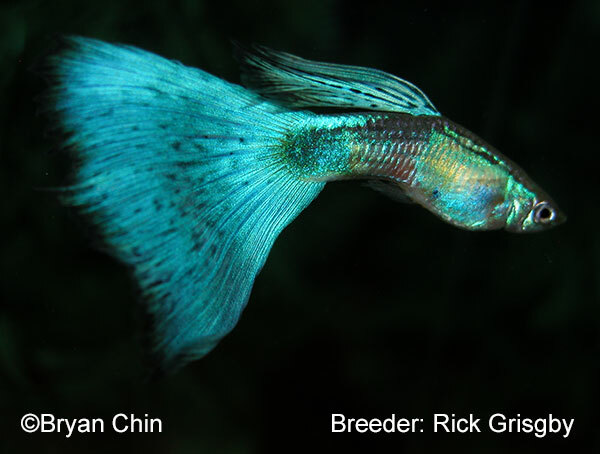 No other third color that is more that 15% should be present or it would considered a multi-colored guppy. A Galaxy type guppy. This fish would be entered in the blue green bicolor class. 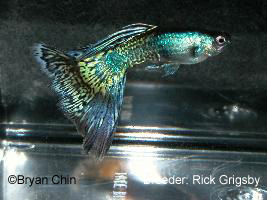 A blue metal head type guppy. 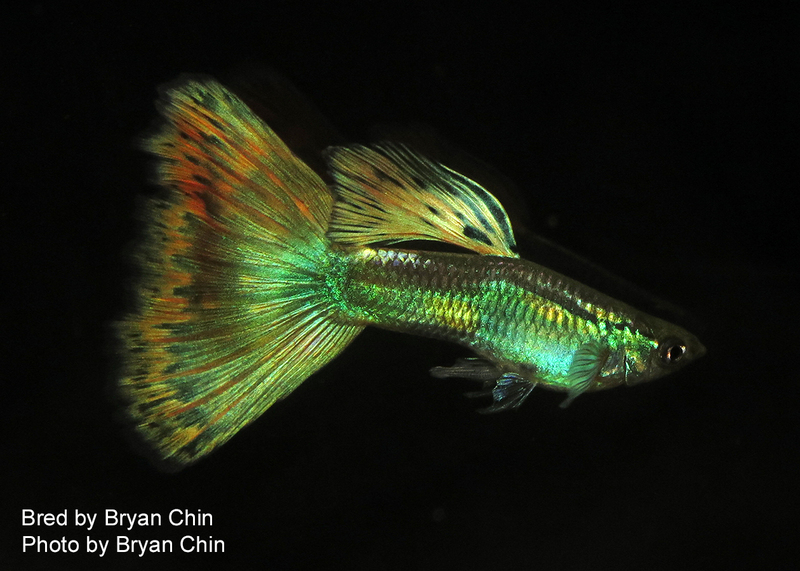 This guppy carries the Y-link traits for the metal head and snakeskin. This fish would be entered in the blue/green bicolor class. This would be entered in the blue/green bicolor class since the green is the dominant color and red is the secondary color. A light blue bicolor guppy. This fish would be entered in the blue/green bicolor class. A light green bicolor guppy. This fish would be entered inthe blue/green bicolor class. Dorsal fin is short and needs to be 1 to 3 proportion instead of its 1 to 2. Good dorsal and tail dot pattern match. A green bicolor with the Y-linked Moscow trait. This fish would be entered in the blue/green bicolor class. 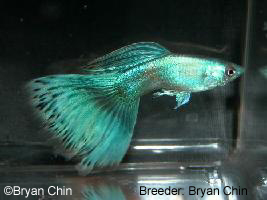 A blue green bBicolor showing the recessive genetic gold trait. This fish would be entered in the blue/green bicolor class. Green bicolor type. Genetic snakeskin and zebrinous male. The zebrinous bars have masked some of the snakeskin rossette pattern. 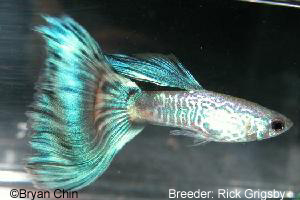 Since there is less than 60% rossette body pattern this fish is entered in the blue/green bicolor class. A green metal head type guppy. 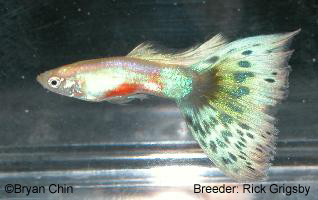 This guppy carries the Y-link traits for metal head and snakeskin. This fish would be entered in the blue/green bicolor class.